The international festival of classical music was founded in honour of Fryderyk Chopin, a notable Polish composer and piano player who visited Marianske Lazne multiple times and grew very fond of the town. The aim of the event is not only to celebrate classical music and to hold a meeting for its supporters from different parts of the world, but also livening the social life through accompanying programs. 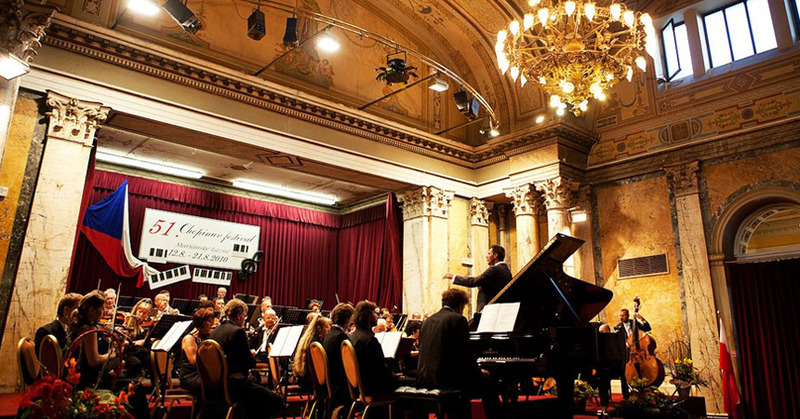 The Festival is held annually by the Fryderyk Chopin Society, which was founded in 1959 and its honorary president became the then piano professor at the Prague Academy of Performing Arts and piano virtuoso František Rauch. The Chopin Festival is the second oldest music festival in the Czech Republic, counting among the most eminent events of its type in Europe. Every third week in August, you can come to Marianske Lazne and enjoy in person symphonic concerts, piano recitals and Saturday and Sunday matinées where world-renowned artists perform.